Wee Lil' Blog: Knickernappies Giveaway #17 plus a Winner from Last Month! Knickernappies Giveaway #17 plus a Winner from Last Month! Last night was the last night to get your entries in for the 16th Knickernappies Giveaway. This morning, thanks to random.org, we have a winner! Congratulations! The winner has been contacted and has 48 hours to respond. For your mandatory entry this month, you'll need to do two things. First, go add yourself as a follower of this blog. Did you do that? *waits a moment* Good! Now in a comment, tell us, "How many diapers are in your current stash?" 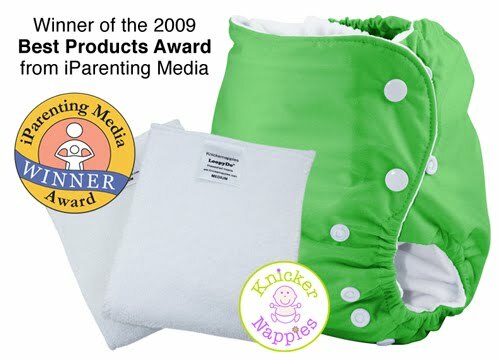 As usual, this giveaway is for any in-stock color of a Knickernappies one-size diaper. The winner will also choose the insert (either microfiber or LoopyDo). **Please remember to enter using an actual name! We've had several "anonymous" entries over the last few months and these aren't valid entries. I have to delete them! Also, you MUST include a way to contact you. If you don't include an email, I can't tell you you've won, so I have to move on to the next entrant. You can earn extra entries once your mandatory entry is complete. Each item is worth one extra entry unless otherwise noted in parentheses following the item's description. 1. Become a Knickernappies facebook fan. 2. Be a Wee Little Changes facebook fan (2 entries). 3. Follow the Knickernappies blog. 4. Follow the WLC blog (4 extra entries in addition to the one within the mandatory entry from above). 5. Tweet about this giveaway, including @weelittlechange (no s) in the tweet. Limit of 10 tweets per contest. Come back and leave us a comment. This contest is open to US residents only and will run from Monday, October 10, 2011through Thursday, November 10, 2011. The winner will be chosen via random.org and posted here on Friday, November 11, 2011. Anonymous entries will not be counted and will be deleted. You must leave a valid email address in your comments so that a winner can be contacted. If our winner doesn't respond within 48 hours, a new one will be chosen. The diaper pictured here is an example only and not necessarily what the winner will receive. Again, the mandatory entry above must be completed before any extra entries will count. This contest is subject to change at the sole discretion of Wee Little Changes. I'm a Wee Little Changes facebook fan! I have about 30 diapers in my stash, most of them are prefolds and covers, but this does not include my newborn diapers since I'm not using them now. I'm a fan of Knickernappies on Facebook (Sarah Jane). I Follow the WLC blog! 1. Wee Little Changes Facebook fan (Sarah Jane). 2. Wee Little Changes Facebook fan (Sarah Jane). 1. Follow WLC blog. GFC: mummytocharis. 2. Follow WLC blog. GFC: mummytocharis. 3. Follow WLC blog. GFC: mummytocharis. 4. Follow WLC blog. GFC: mummytocharis. I'm a follower and I think I may have 30 something in my stash now? I'm a follower! I am just starting out on my stash.. and I have 4 diapers! Thanks for the chance. I am following via GFC and I have 56 diapers in my stash. Thanks for the giveaway! I currently have about 15 diapers, preparing for future wee one. i currently use 12 os diapers in my stash and for the newbie due in december i have 22 sized. I follow with GFC, and I currently have over 80 in my stash, I think. I've sorta lost track! :P Most of those are ones I sewed myself though, and I have really been wanting to try a side-snapping Knickernappies! I follow you on GFC and I think I have 28 but I have given some away and gotten some new ones, so I need to count again! I like Knickernappies on Facebook (Madeline Doms Miller). We have almost 35 diapers in our stash for my 2 girls. Its not much but hopefully soon we will be able to get more! Its made up of a little bit of everything since we are still new to cloth and trying out everything from flats to hybrids. I follow via GFC as Vanessa Coker. I have 13 diapers in my current stash. I'm a Knickernappies fan on Facebook as Ps Mamae. I'm a Wee Little Changes fan on Facebook as Ps Mamae. #2 - I'm a Wee Little Changes fan on Facebook as Ps Mamae. I follow the Knickernappies blog via GFC as Vanessa Coker. #1 - Following WLC on GFC as Vanessa Coker. #2 - Following WLC on GFC as Vanessa Coker. #3 - Following WLC on GFC as Vanessa Coker. #4 - Following WLC on GFC as Vanessa Coker. Follow via GFC currently only 5 in my stash. our current stash has about 40 diapers.... wasn't sure if I should include each flat as a diaper or just the covers, so I didn't count those! I follow your blog via GFC as Carolyn H and I currently have 36 diapers in my stash :) Yes, I'm an addict! Follower. I currently have about 120 in my stash. 40 of those are Newborn and Small and the rest are One Size diapers!!! I have 24 flats, 24 prefolds, 10 pockets, 2 AIO, 9 covers (6 small, 3 medium), 1 fleece cover, 1 fitted.